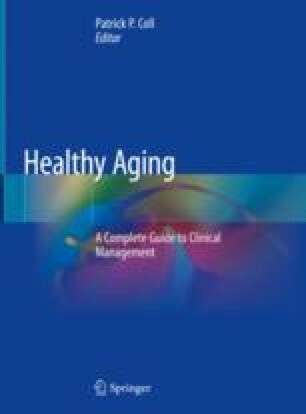 Healthy aging has been defined as the “development and maintenance of optimal mental, social and physical well-being and function in older adults” . Preventing and managing pain in later life is critical to help individuals achieve healthy aging, maintain independence, and preserve autonomy. This chapter reviews the epidemiology of pain in older adults, summarizes differences in pain perception as a function of age, and describes recent evidence regarding the impact of pain on function and quality of life in older adults. We also provide recommendations for practical methods to assess pain in older adults, summarize key primary prevention efforts that clinicians can implement to reduce the occurrence of new cases of persistent pain, and present management strategies that are appropriate for use in the era of the opioid epidemic. Dr. Reid is supported by grants from the National Institute on Aging (P30AG022845, K24AGO53462) and by the Howard and Phyllis Schwartz Philanthropic Fund. http://www.health.state.mn.us/divs/orhpc/pubs/healthyaging/hareportnofs.pdf. Accessed 28 Feb 2018.
https://www.iasp-pain.org/Taxonomy. Accessed 28 Feb 2018.
http://www.pewinternet.org/2017/05/17/technology-use-among-seniors. Accessed 28 Feb 2018.
https://www.cdc.gov/vaccines/vpd/shingles/public/zostavax/index.html. Accessed 28 Feb 2018.
https://www.ncoa.org/blog/10-common-chronic-diseases-prevention-tips. Accessed 28 Feb 2018.
https://www.cdc.gov/physicalactivity/basics/index/html. Accessed 28 Feb 2018.
https://www.jointcommission.org/assets/1/18/Joint_Commission_Enhances_Pain_Assessment_and_Management_Requirements_for_Accredited_Hospitals1.PDF. Accessed 1 Mar 2018.
https://www.practicalpainmanagement.com/resource-centers/opioid-prescribing-monitoring/risk-assessment-safe-opioid-prescribing-tools. Accessed 1 May 2018.